by far the most unplanned trip we’ve ever taken..
Travel is a huge part of how we live. We live a lifestyle that is conducive to always being on the go. We homeschool our children (which means we do school, everywhere, all the time). I work from my Macbook (which is basically everywhere, including traffic jams). We hired a farm helper (so Turo can supervise farm operations even remotely). We are lucky because we can just go to any place when we want to, without asking permission from the school or office, without being accountable to anybody but ourselves. Lucky, yes. But also because we made a great deal of sacrifices before we can be at this point and state in our lives. Our family has not stayed home for over a month. We have spent the entire month of May at my in-laws, at my parents’ home, at my uncle’s resthouse in Aklan, and, the highlight of our trip, Boracay! The first twelve days of May were what we considered a ‘mobile transition’. Turo and I had been traveling back and forth our house making sure everything was well and in order (and relieving our homesickness to some extent). 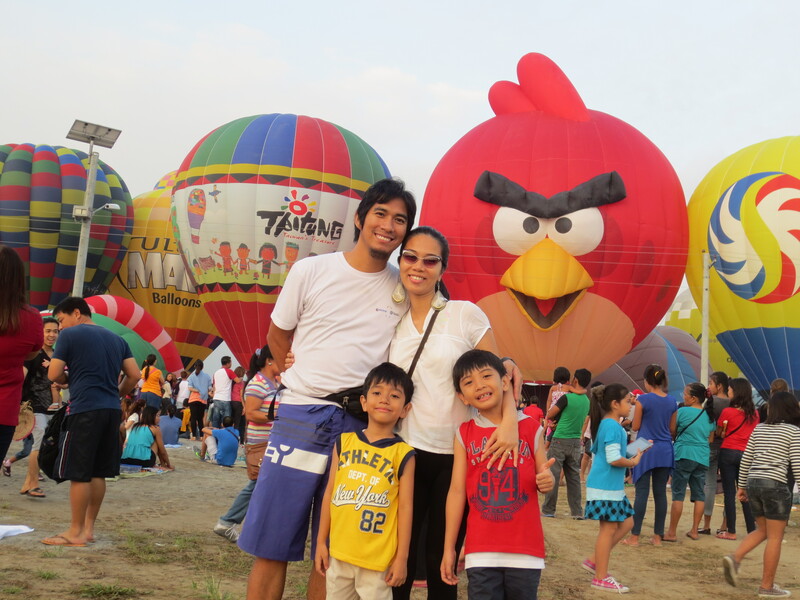 All April, we had been getting ready to spend plenty days away from our Los Banos home come May. 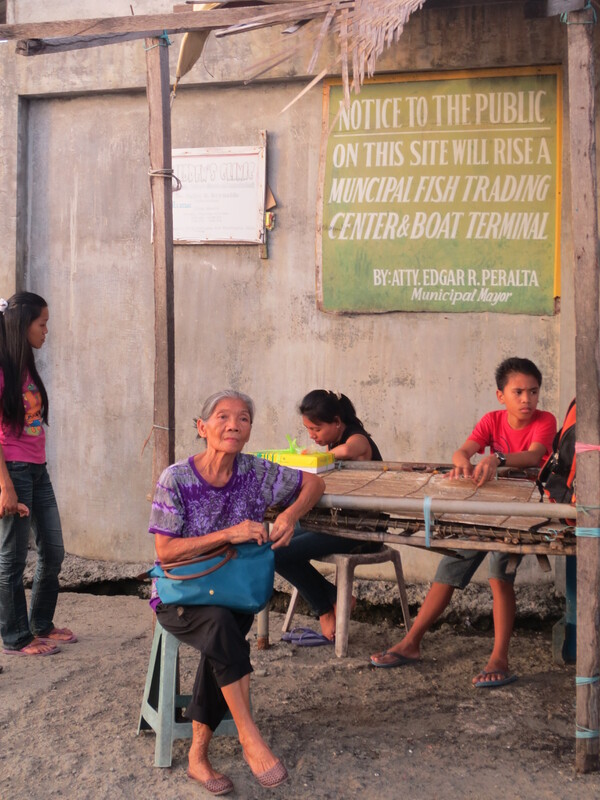 Our first stop was at the house of Turo’s parents in Cavite. Turo is just recovering from a near-heat stroke during this time and we needed him to always be rested and away from the sweltering summer heat. Despite doctor’s orders, he insisted on being productive and took on his first landscaping project in his parents’ backyard. This project had both Turo and I, and the kids, all excited. We were together buying floor pavers, picking out tiles and choosing the right paint colour for the back patio. But the most exciting part of all was waiting for the plants to arrive and watching them bring new life to the otherwise abandoned section of the property. 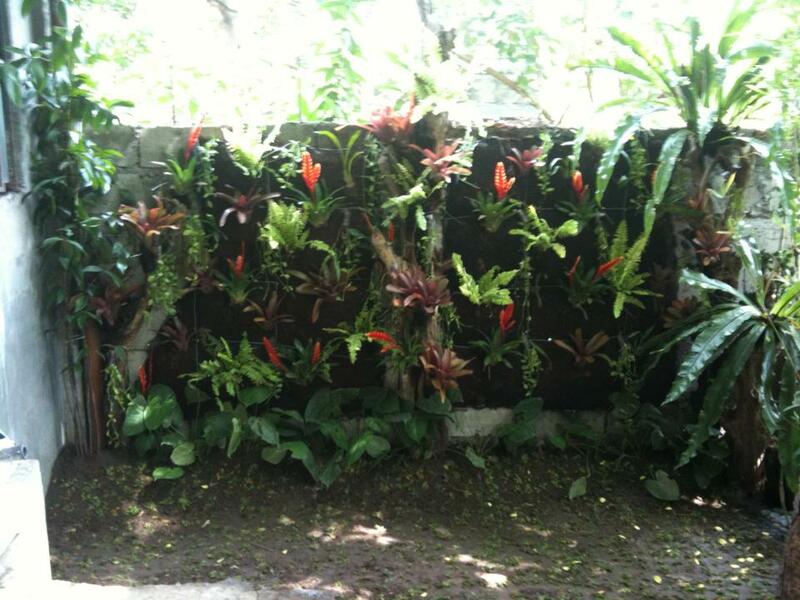 A fern wall accentuated with lovely red bromeliads took centerstage at one end of the yard. 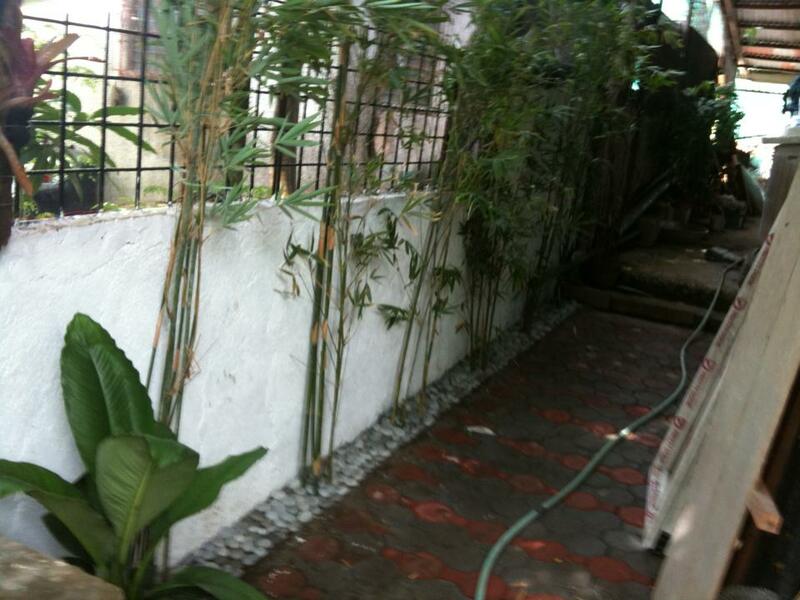 The sides were planted with slender Thai bamboo against roughly finished white concrete and pebbles. The flooring on the other end was covered with locally made concrete paving blocks and the rest of the are was planted with frog grass. By this time, we are still waiting for the grass to grow thick so the kids can run around the new lawn. By the time Turo, our project manager, declared the project complete, we packed up and moved on to our next destination — my parents’ house in Cainta. 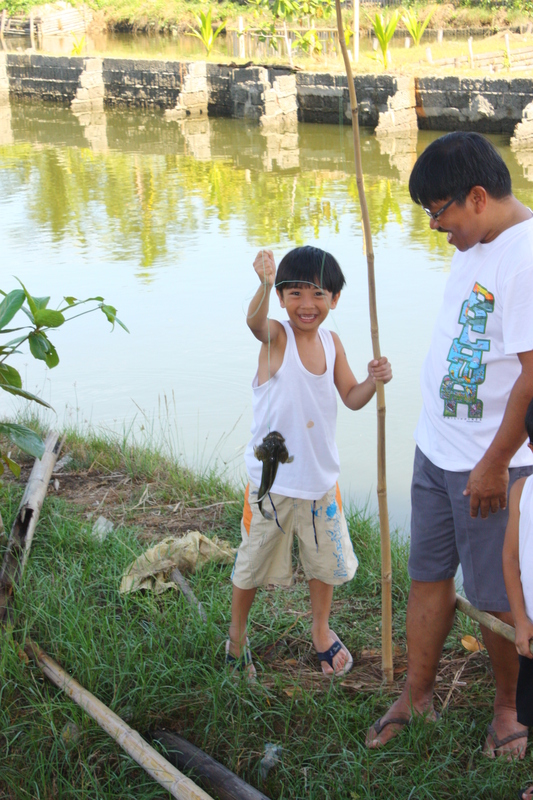 Staying in Cainta did not take a lot of getting used to for the kids. We lived there when they were babies, before we moved to Los Banos a couple of years ago. This was their home too, as this was mine for most of my life. Cainta was our take-off point for our much awaited trip to Aklan province. Aklan was my grandmother’s hometown and we were more than happy to accompany her back to her motherland, after how many decades. She was really excited. We can tell from the photographs we took of her, from the way she told stories of her life here in the 1940s, and how she managed not sleep during the two-hour land travel to her New Washington hometown. The kids had some real provincial fun as well. 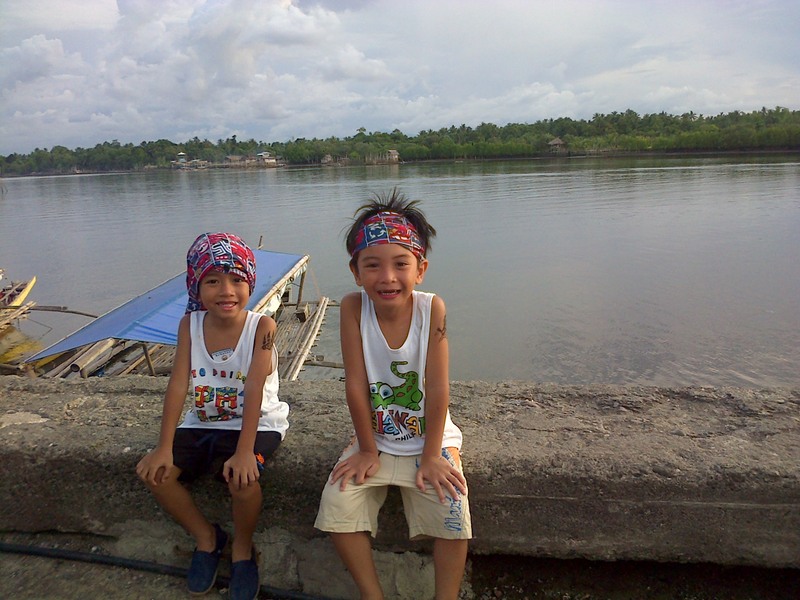 They played with dogs who had houses up on stilts, walked on floating bamboo rafts and a hanging bridge. They even went fishing for the first time! And then there was Boracay. 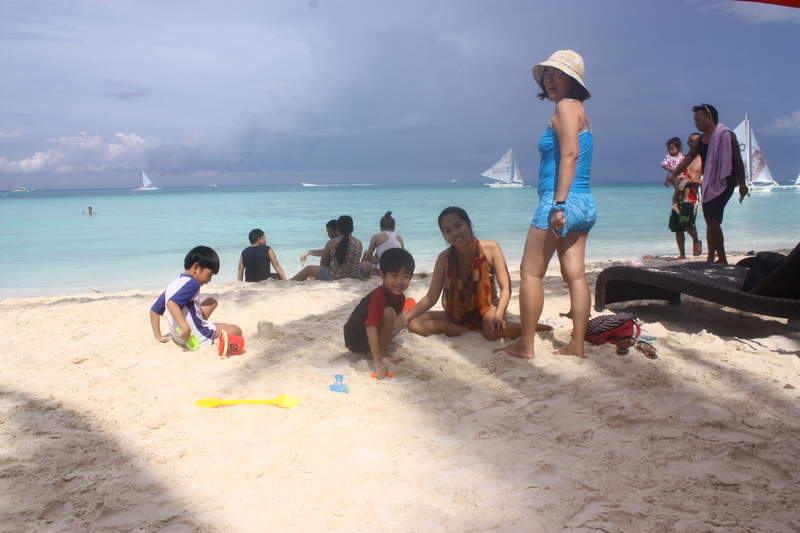 It was our first trip to this famous white sand beach together as a family. 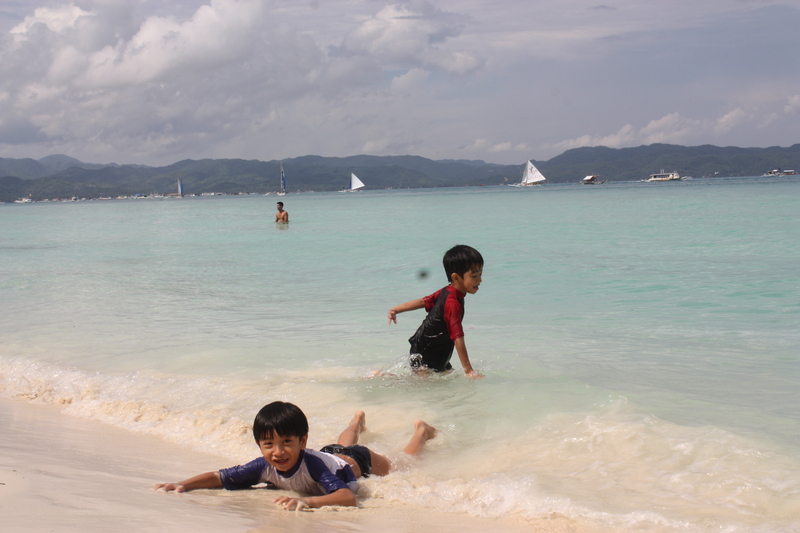 We enjoyed ‘Bora’ despite the crowds and the noisy parties at night and overpriced accommodations. We came there for the legendary beach, and we swam our hearts out up to the minute that we were about to check out from our hotel room. 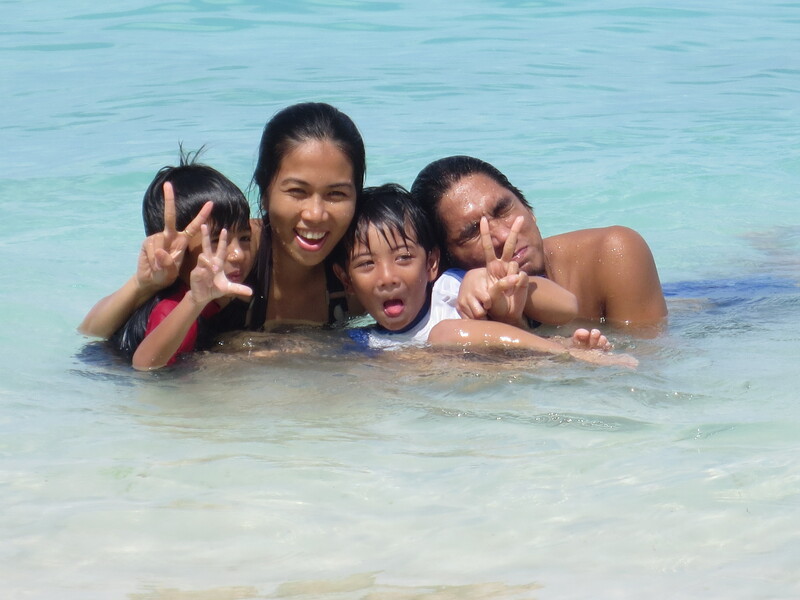 We love swimming and we love the beach and Boracay proved to be another memorable beach experience for us. 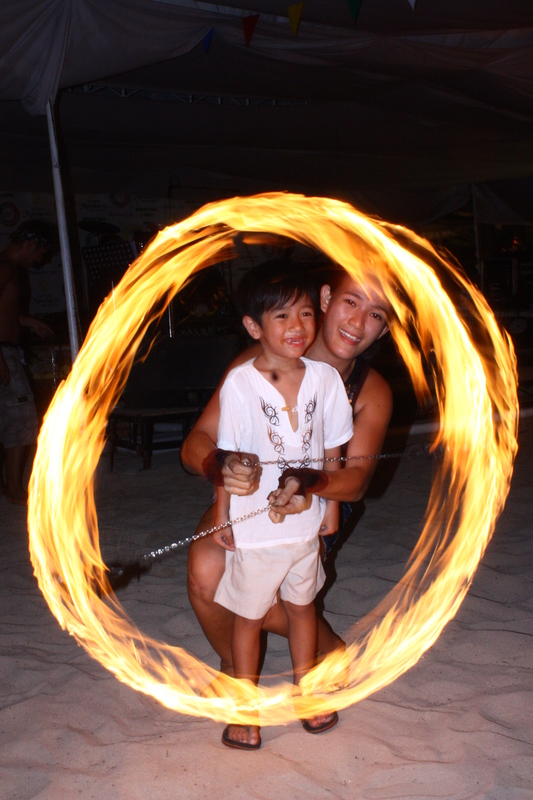 At night in Boracay we watched a fire dancing performance, which we enjoyed, and the kids were obviously impressed. They even danced Gangnam onstage together with the fire dancers. 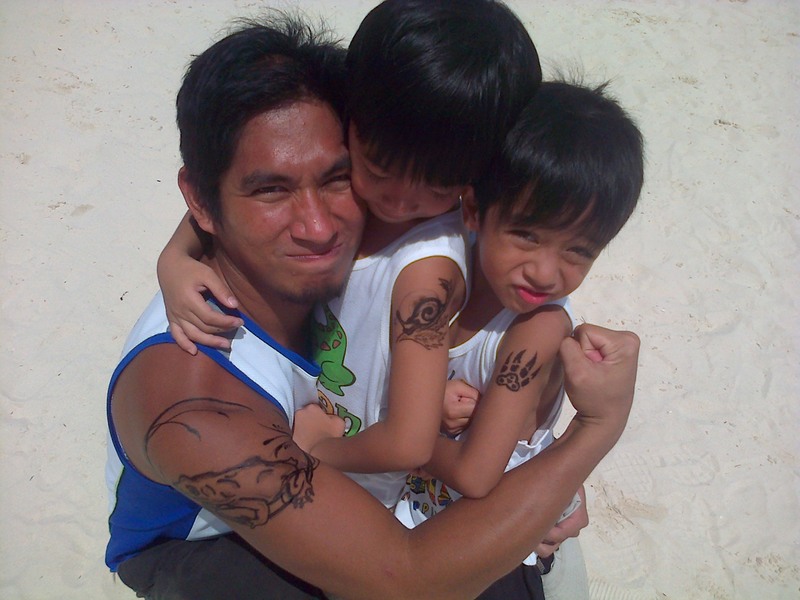 Turo and the boys each got henna tattoos on their arms, which they were really proud off until the day their tattoos faded out. I guess these were the highlights of our long, mobile summer. It was the first and longest time we spent away from home, and we enjoyed every minute of it. Sure, we missed our home but we always knew it would welcome us back at the end of summer. And it sure did. Our mobile summer experiment was an astounding success. Now Turo and I are starting to plan for next year’s summer break, which we swear will take long, and will be packed with more exciting adventures. who doesn’t like summer vacation? A few weeks back I was close to pulling my hair out making plans for the kids once their schooldays end. I was worried they’d get bored, and annoy me, and I’d end up not being able to concentrate on my work (I work at home again, thank God). And so I was scouting for swimming lessons, craft workshops, football classes and all sorts of things that would keep them busy, and buy me a couple hours of ‘serious work time’ each day. But at the same time, I was also trying to create a more organized schedule for all of us at home. This summer is our homeschool trial period, and if we are ever going to be successful with our bahaySKUL experiment, the best time to start is right NOW. So after some high-level budget calculations, we were down to the fact that we can’t afford to enroll the kids in some fancy one-hour-a-day-for-10-days-only summer activity. We are saving up for school registration fees so we’d be worry-free after school starts in June. We also need to put together our bahaySKUL, which means buying our own stash of school supplies and educational materials so we can provide the best possible homeschool environment for the boys, particularly Ari. This also means that I’m stuck with the kids and they’re stuck with me, 24/7 for the rest of the summer. Don’t get me wrong. I love my children. But being around each other forever can get pretty crazy, especially in our small household. My personal space bubble cannot accommodate my children throughout the day. What am I to do then? We devised an ingenious schedule that lets me be with my children, do household duties and get some (office) work done, without nobody getting to anybody’s nerves. I’ll let you in on some tips. Share house duties. If I’ll be cooking breakfast, lunch and dinner, and preparing morning and afternoon snacks for the monster-eaters in my household, that’s going to take up about 5 hours of my day, not yet including the time we would be sitting down on mealtimes. So Turo and I made a deal that we would be alternately cooking lunch and dinner. Breakfast is easy as we normally just have sandwiches or toast or cereals or leftover, so it’s a breeze to prepare. I need about 30 minutes to an hour to prepare lunch, which is also when I take a break from my desk while charging my computer and cellphone, supervise the kids as they take a bath, and watch ‘Minute to Win It’ on TV. Turo takes charge of dinner, which means I am chore-free all afternoon and can return to work. Turo also committed to spend an hour each day to do some fun stuff with the kids: play music, read comic books, practice basketball. Things a frail mother like me won’t be able to do with rowdy boys. But which gives me an hour to check and reply to emails. Involve the kids. While main meals are off the list, snack time is another matter. I’m now trying to turn snacktime into a major activity at home. I let the children decide on what they want to eat, and let them prepare it with me. I use this opportunity to teach them about food and nutrition while practicing motor skills, like when beating eggs or spreading jam. We’re trying to incorporate more fruit into our diet now and snack time is a great venue to do so. Magic mango slices, banana sprinkles, pineapple and salt, are some of the fruity snacks we’ve had in the past days. Give kids some time out. My boys are extremely active with extremely short attention spans. They’ve not yet reached the point when they would sit down and work on something for a long period of time. They always need to be on the move, otherwise they’d be on the floor wrestling, which aside from being rather dangerous as somebody might get hurt, annoys me so much because of all the noise and because of trying to keep them apart when they just wouldn’t. In order to prevent this from happening and keep me from losing my sanity, I included in our schedule tub time in the morning (where they can swim in the giant bucket outside and have some water fun) and outdoor play in the afternoon (they can go biking, kite flying or just run around in the park which is only a few blocks from where we live). Some outside time is a great way for them to release excess energy so they would be relatively more behaved once indoors. It is also during their outdoor playtime that I schedule Skype calls and serious writing stuff so there is zero distraction at home. Get a TV sitter. I know this is not the greatest idea of all but television is still a part of our day-to-day life. In the mornings after breakfast until about 10am when the cartoons run out, my children are allowed to watch TV. I just make it a point that I know which programs they are watching. We don’t have cable so we don’t have endless cartoon channels. And we also don’t have a remote control so nobody goes channel surfing around here. But two hours of their TV time is equivalent to two hours of uninterrupted writing time for me. And that’s more than a bargain. Give kids some time. After six years, I finally realized that the key to getting your children to follow you is when you first listen to them and follow what they have to say. Before I always used to say, “we’ll do that later after I finish my work”, but my children would just keep bugging me about whatever it is they want to do and I wouldn’t be able to concentrate on my work and after an hour or so would still end up doing what it is they wanted to do with me, without having accomplished anything. This time, I ask them first what they want to do, whether to read a book or do some craft or cook pancakes, then I give them my full attention and we work on the activity together. And when we’re done, everybody’s happy, my children are suddenly angels, and I can start to do some serious work without them bugging me. The important realization here is, parents will still always end up doing whatever it is their kids ask of them, so why delay? If you give them your time and attention now, you’d be surprised that they’ll return the favor and give you your much-deserved peace and quiet. Take a break, get some rest. My children are at that age when their bodies still don’t have enough energy for an entire day’s play, but they can’t be forced into an afternoon nap either. Still, I included a 1-hour rest time into our daily schedule. Nobody is forced to go to sleep, or forbidden to get up without having slept (I can remember the trauma of this when I was younger). But everybody is required to stop everything they’re doing, lie down and rest, everybody adults included. Rest time is prompted by the reading of a storybook after fun time with Turo. And the best part of this routine is that I get to have some rest too! Post the actual schedule. Children are not idiots nor are they inconsiderate. They wouldn’t force things that are outside the rules, especially if you are consistent with the rules. We value consistency in our household. And it is a cornerstone in the way we discipline our children. After we finalized our daily schedule (the kids and I prepared it together), I printed it out and posted it on the side of the refrigerator where everybody can see it, and near the clock so they can check when it’s already time to do what. One reason is for the kids to see it and so they wouldn’t insist on doing activities that are not yet scheduled to be done. But the more important reason is to remind me to actually make time for the activities that I had committed to do with my children. If posting a schedule where everyone could see it is the way to hold me accountable for the things I had promised to do with my kids, then so be it. Our summer schedule is not cast in stone. It is flexible in the same way that our life itself is flexible and adaptive. 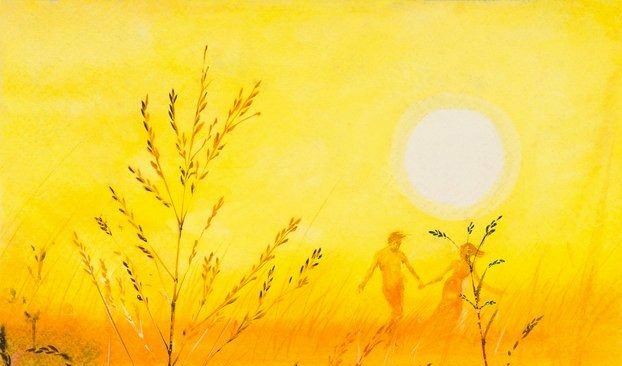 My children and I have thought of so many things we want to do together in the next 2 months. Now I wonder why I was even anxious of summer being here and of school days’ end. To be honest, this year is the best summer vacation I have ever had. And I’m not even on vacation!